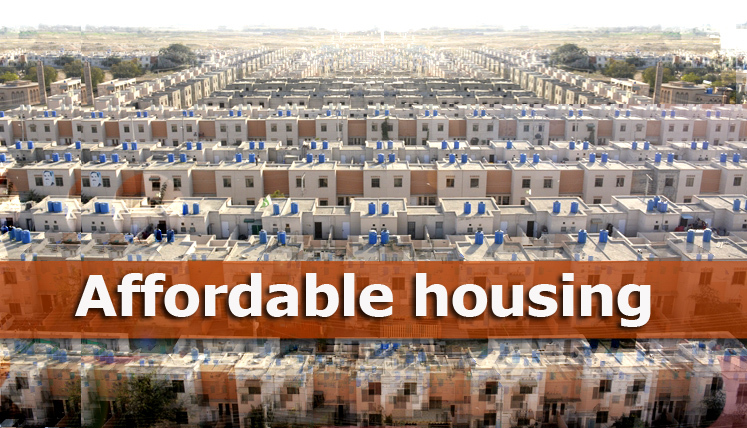 Affordable housing means low priced housing or inexpensive housing. Houses which are affordable by the average wage maker. Rent houses where a part of monthly rent is paid by authorities. Housing affordability is the main subject of discussion around large cities. In the 19th century, when cities grew larger, prices of housing become more and more expensive. The population in Pakistan is growing faster than the construction of new houses. These are institutions in Pakistan which are making low cost housing facilities. But more efforts are needed to stabilize the housing market. The problems related to housing. There is a huge shortage of houses in Pakistan and especially in the city of Quetta. This shortage is growing with time. According to one survey, 90 lakh houses must be built in Pakistan to overcome the shortage. As being related to real estate, I have been to such tiny apartments that most people reading this article cannot even imagine. I have seen all those dark dens which people call home because they don’t have any other choice. Have you ever heard of coffin houses? This is a term used for small living spaces usually shared by tenants. It’s like when people rent a room and make small partitions in it for themselves. Which are not safe to live in as there is hardly a safe exit in case of fire or earthquake. When beds are stacked on top of each other it’s called caged beds. Apartments the size of a prison cell with no windows. When there is no proper sewerage and children are getting sick only because of bed bugs than the government needs to intervene big time. Only one percent of property stock is owned by 70 percent of population of Pakistan. Rents are growing on tremendous scale. People spend a large part of their earning on monthly rent. Monthly rent for a shop at Shahbaz town Quetta can go up to 1 lakh rupees per month or even higher. locals will have to leave these shops soon and international companies will rent these shops. which will make it even more un affordable. Supply and demand decides prices. Developers are making luxury houses while market needs affordable houses. This is very common at the peak of real estate cycle. In January 2016 when the market was in fast mode people were making luxury houses. After the announcement of property taxes developers started to make low cost houses. Because in a real market it is hard to sell luxury houses. The same thing was noticed all around the world after the 2008 financial crisis. In 2009 people were making only low cost houses. Which is the right thing to do. The good guys, people who are making affordable houses. Jawad aslam is the founder of AMC. Amc builds low cost housing in Pakistan. They make their developments around congested areas. Amc is making houses in Lahore.Their goal is to sell the last 25% of remaining property at premium to stay profitable. PHA foundation is also providing low cost housing since 1999. Ashiana housing is the project of government of Punjab. A good initiative towards providing low cost living. They claim that this is the largest affordable housing scheme in Pakistan to date. It mainly consists of flats. One and two bedroom flats. Allotment is based on the basis of a draw. Terms and conditions of Ashiana housing scheme. The applicant must have CNIC of Punjab. Applicant’s total family monthly income must be lower than 50000 rupees per month. The applicant must have no other plot. The applicant’s age must not be over 55 years. The prices starts at 12 lac rupees with 8000 rupees monthly installment plan. Saiban an ngo in Karachi is planning low cost housing by the name of Khuda ki Basti. Its an installment based project. Khuda ki basti is in the region of Hyderabad. Eden housing is providing low cost well maintained well managed housing. Kirani, Darakhshan, Sraghuragai housing schemes, Labour department low cost housing. Low cost houses for Qda employees. Low cost housing Sirki road. Shalkot housing scheme and Zarghoon housing scheme was an attempt to provide low cost housing to the people of Quetta. Most of these housing schemes are still under developed. Hong kong has a population issue which means not enough space to house all the people. Micro flats tackle Hong Kong’s high housing prices. Square meter of living space in Hong Kong can cost up to 25000 dollars. So a new trend has emerged which is micro flats. You can find flats as small as 20 square meters in Hong Kong. The average size of the micro flats is about 15 meters which is the size to park two vehicles. So this was one way to own a home for young people in Hong Kong. UK has some good infrastructure in place to maintain the number of affordable properties. Every housing project must ensure in advance they will also built 25% extra accommodation which must be affordable. Rental properties are also built by organizations which gains funds through philanthropic works. Council houses is also a form of low cost homes in UK which has good governing structure. China provides free land to its private sector builders to build cheap housing. These houses are priced below market rate. What needs to be done? The possible solution. The government must come forward and announce low cost housing schemes. Foreign investors must be given permission. Cheap loans should be easily accessible. Make it easy for the banks to deal in property loans. Allowing micro finance such as SME bank to release small loans. Tax relaxation for low cost housing societies. Land should not be for speculation it must be for living. Computerize all property records to make it easier for the banks to understand it for the loan process. The “kachi abadis” which are becoming more and more crowded are mostly close to the luxury and expensive neighbor hoods. The best thing is to buy those areas as a whole and convert it into properly planned housing schemes. After developing the area plots can be given to the original owners and the rest of the land can be sold for profit by government. That’s what DHA does in some areas. The best example is the Miami south beach in America. When developer Isaac Kramer first went in there parts of that area was a slum. Now it is one of the best location to live. So how do we make the land affordable? How do we stop the prices from going higher and higher? The easy answer is tax. Tax the hell out of property. Put more and more taxes on the property that it become a burden for the rich investors who has hundreds of plots and houses. Tax the property and give subsidy on more basic things like food, flour, sugar and oil. Countries around the world has proper tax system for real estate which stabilizes the market in a good way. Singapore’s property tax model can be a better alternative. We are so thankful to government for increasing taxes on property. it really stabilized the market. It stopped the prices from going higher. This was the only option the government had in 2016. Because the country was on the brink of financial crisis. In 2014 I predicted that the government will come up with some kind of solution to keep the investors out of property business. Otherwise everyone will invest their money in property and other businesses will collapse. My predictions were true as we saw in 2016. It’s like when a machine is running too fast and there is a chance it will blow up and you turn it off for a while to cool it down. That’s what they did in 2016. In Pakistan there are people who has thousands of acres of land which is never used. They don’t cultivate it. they don’t develop it. They don’t do anything with it. Why don’t they don’t do anything with it? is because they don’t need to. It’s been in there family for years. So where ever there will be uncultivated land there will be unemployment. The government must come up with a proper plan for this uncultivated and undeveloped land. With proper planning housing can become affordable.